This is a huge internal problem, which is not being addressed with the required speed or seriousness. Still no official Palestinian list of the new government – but it's being called a "national consensus government"
How is it that there is no official list? This is the minimum a new government should be able to do. Inevitably, the conclusion is drawn that this has to be, for some reason, deliberate. Meanwhile, we have received the text of the statement made to the media by Palestinian PM Rami Hamdallah yesterday morning, after he chaired the first meeting of the new 17th Palestinian Government — which he said “is a is a national consensus government”. Hamdallah noted that this new government “is based on the foundation of an independent and national technocracy”. And, he said, “This government sustains the President’s vision and will implement the PLO political agenda”. Continue reading Still no official Palestinian list of the new government – but it's being called a "national consensus government"
Posted on June 4, 2014 Categories PalestineTags new government, State of PalestineLeave a comment on Still no official Palestinian list of the new government – but it's being called a "national consensus government"
The new Palestinian Government Cabinet meet in Prime Minister Rami Hamdallah’s office in Tuesday morning in Ramallah. But, even by the end of the day, there was still not official Palestinian list of the members of the new Palestinian Government…Asked for a list on Tuesday afternoon, Dr Ehab Bseisso, the Palestinian Government Spokesman, told me a list of ministers in the new government “is being prepared” and “will be distributed to journalists”…See our post yesterday for best available information on this. 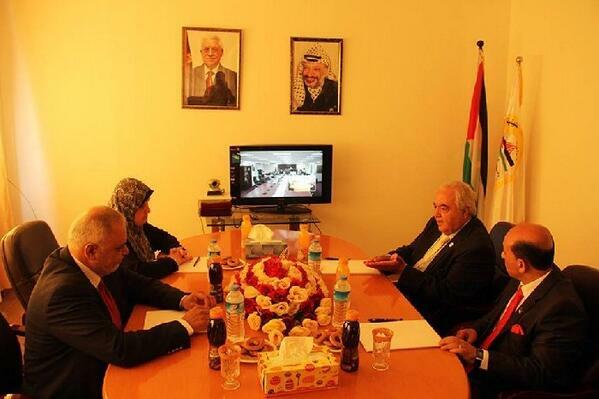 The four members of the new government who live in Gaza participated in Tuesday morning’s Cabinet meeting by videoconference — as we learned only from Twitter. All this information [which he alternatively dismissed as “details”] was in the news, Dr. Bseisso said [though none of it was]. He insisted that the only question that should be asked is why Israel would not allow them through. Why was there a videoconference today, for the cabinet meeting [but not yesterday, for the swearing-in]? After more verbal sparring, Dr. Bseisso said that they believed assurances they had received up until the last minute that everything would be fine [despite prominently-published news reports on Sunday saying that Israel would not allow the ministers from Gaza to come to Ramallah]. So, they had made no preparations for a videoconference. In remarks to journalists today in Ramallah, PM Hamdallah reportedly said that “All members of the government will go to Gaza despite the measures taken by Israel to prevent Gaza-based ministers from going to Ramallah” …apparently, even if this means travelling to Gaza via Egypt rather than via Israel. This was reported by the Times of Israel, here. Palestinian President Mahmoud Abbas swore in a new Palestinian Government today in the Ramallah Muqata’a. It was later explained – incorrectly, and this was just part of the confusion – that al-Aiyssa was given a third portfolio, Prisoners… but at the moment he was sworn in, no such thing was announced. UPDATE 2: PM Hamdallah said to the media the next morning [again, see above]: “Concerning the issue of transforming the Ministry of Detainees to a commission under the PLO, the government regards this as the part of the President’s mandate and the PLO’s responsibility. For the time being, Mr. Shawqi Al-Ayasseh will assume the role of caretaker of the Ministry of Detainees”. Palestine TV aired what seemed to be a pre-recorded speech by Mahmoud Abbas, a few minutes after the swearing-in ceremony in the Muqata’a. A little later, Palestine TV aired statements by Abbas + Hamdallah at initial meeting in Muqata’a of new Palestinian government [and announced that an Ismail Haniyeh statement was expected…] Abbas spoke to the new cabinet about elections [presidential, Palestine Legislative Council + also, for the 1st time ever, for the PLO’s Palestine National Council]; he also stressed the 1967 borders, which he stressed include East Jerusalem. The new Palestinian government is supposed to prepare the way for long-delayed elections in which Hamas’ electoral strength will be tested + measured.